The Park Place Residences location is in Paya Lebar Quarter, at the corner of Paya Lebar Road & Sims Avenue. It is very conveniently positioned right next to Paya Lebar MRT station, in the nook of the 2 arms of the interchange that joins the East-West and Circle Line MRT stations. 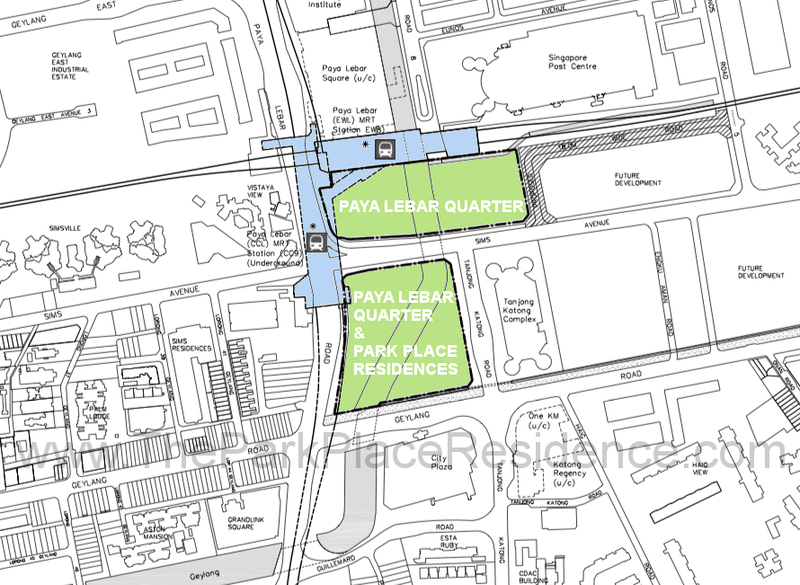 Paya Lebar Quarter will have direct access to both arms of the MRT station, at the basement as well as ground levels. This location is also in the heart of the Paya Lebar Commercial Hub, undergoing urban regeneration as one of 4 regional centres identified under the URA Master Plan, to decentralise Singapore’s commercial and business districts. The Park Place location, in Paya Lebar, is on the city fringe, just 10 minutes drive off-peak into the Raffles Place CBD, Marina Bay, and Orchard Road. Paya Lebar Regional Centre promises to be one of the most exciting growth areas, given its proximity to town, and yet untapped potential. 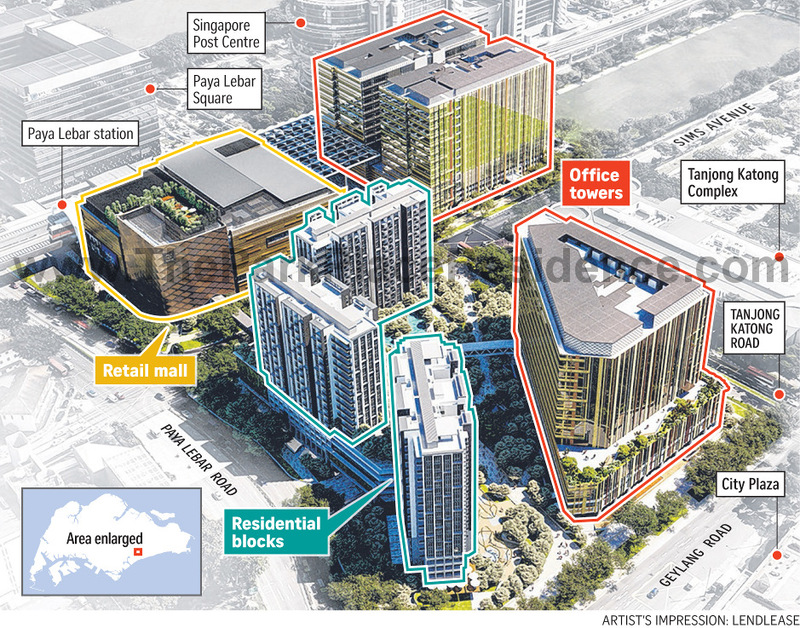 Paya Lebar Square was just the start; Paya Lebar Quarter will expand the transformation. The whole landscape will be changed, making this one of the most fun and interesting places to hang around in. Being such a sizeable mixed development, Paya Lebar Quarter will have everything for the residents of Park Place: offices to work in, a huge retail mall for shopping, F&B outlets & supermarkets, and lifestyle products & entertainment outlets for play. On top of all that, residents have immediate access to an MRT station, which offers direct connectivity as well to over 60 other stations on the East-West & Circle Lines. In fact, the Circle line has the advantage of joining to every other line, so they are literally only one connection to everywhere else in Singapore. The Paya Lebar Quarter location is in a culturally rich and diverse area. 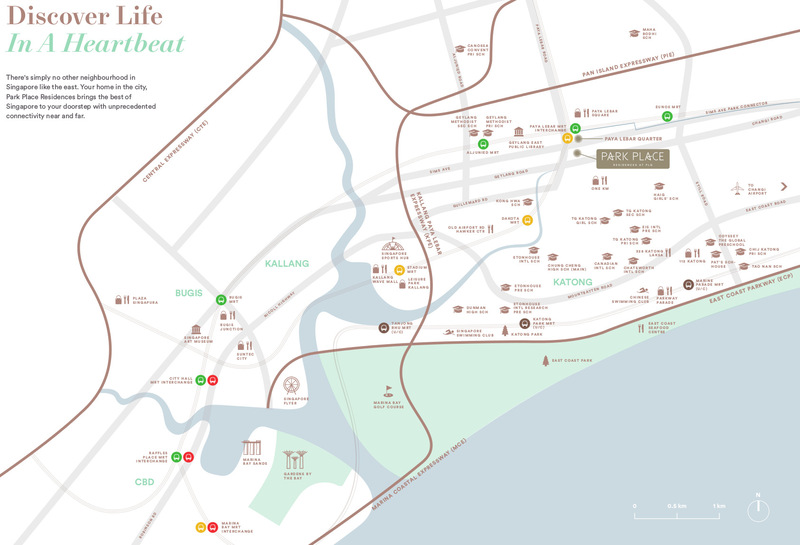 It is next to Joo Chiat and Katong, home to some of the most established food havens.
. 15 minutes MRT train ride to Raffles Place on the East-West Line.
. 18 minutes MRT train ride to Esplanade on the Circle Line.
. 20 minutes MRT train ride to Dhoby Ghaut on the Circle Line.
. 10 minutes drive off-peak to the CBD.
. 15 minutes drive off-peak to Changi International Airport.
. 0.6 km to the exit to the PIE (Pan Island Expressway). Please register here if you would like to be kept updated on Park Place Residences and Paya Lebar Quarter.